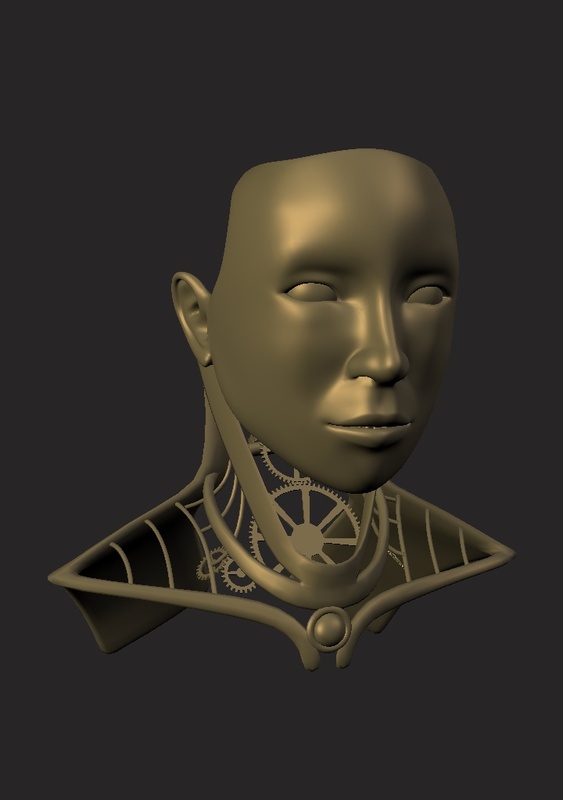 A while ago I had a project to create a steam punk style android in Blender. I’ve decided to revisit the idea with an oriental twist, and thought I’d share the process. So far I’ve done some concept art and research and done part of the modeling of the head and shoulders. After collecting some reference images, I started by creating a concept image in the GIMP. As I didn’t want to spend too long on it, this was achieved through starting with a photo reference that had the rough pose I wanted to use, and then switching the head for one that more closely resembled the final look I’m going for. Then I sketched on some details of the clockwork/metalwork elements over the top, and painted over the face to give it a metallic look with the doge/burn tool (very useful for metallic highlights and shadows). Concept - created in the GIMP with a bit of photomanipulation and some painting. 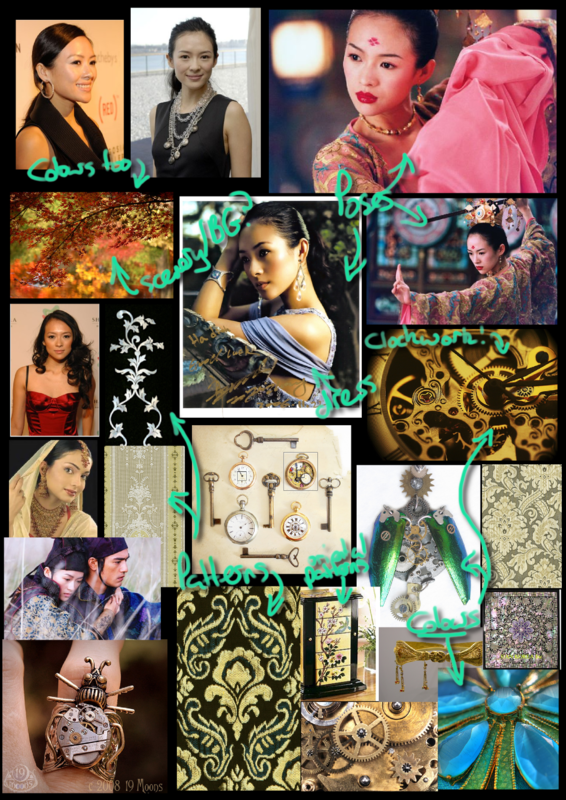 Mood board showing some of the elements I want to incorporate, mostly collected from Google images and cgtextures.com. 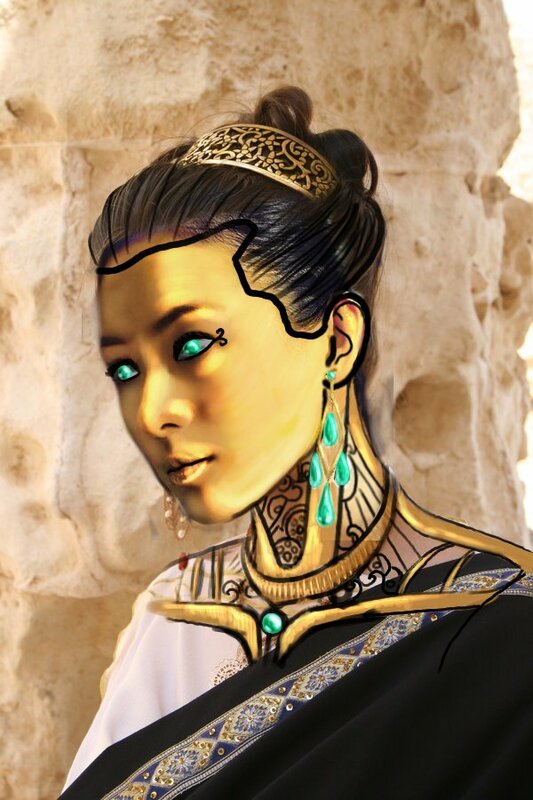 The front view reference is Chinese actress Zhang Ziyi. Originally I wanted to use her for the side view reference as well, but for lack of a good image I gave up on that idea. Instead I tried something new. I chose a reference image from deviantArt (by Katanaz-Stock) as a side view reference, and used the iWarp tool in the GIMP to match the major facial features up with the front view reference. I was worried that this wouldn’t work at all, but actually the results are rather pleasing, and in fact even allow me to introduce new features into the model. For the shoulders and clavicles, I used a scan from an anatomy book of mine, Anatomy for the Artist by Jeno Barcasay (note – it’s mirrored to fit with blenders front and side views better, the side view should always be facing left if the front view faces forward). It’s a great book full of useful reference images and it’s less than £5, plus if you use the link I get a few pennies! Anyway, I hope to update soon with some more progress. Leave comments, particulary on what you thought of the screencast, in terms of the speed of the video, length, etc. Thanks for viewing! I downloaded Blender last week, and I am amazed at what can be done with this 3d software, and it is free! Great project keep up the good work. It gives inspiration to beginners in 3D Digital Art. Your video is probably good but my browser did not show either it or the link to it. I want to applaud, I am still quite new to 3D in general. This shows alot of the thaught and design processes an idea goes through before the modeling even starts. What tools did you use the most in blender? Thankyou for sharing and keep up the good work.